Your guest will receive three chips. 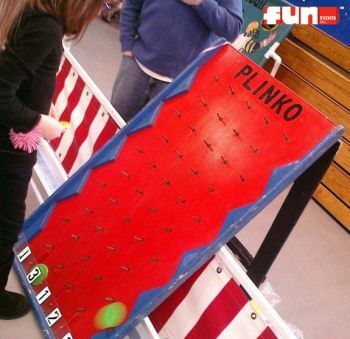 The chips are placed on the Plinko board by the player. The chips "plink" through the maze to the bottom of the game board. Land two chips in the same slot and win 2nd place prize. Land all three chips in the same slot and win 1st place prize. For all ages. A fun game rental party idea for birthday parties, church festivals, school carnivals, company picnics or any special event.